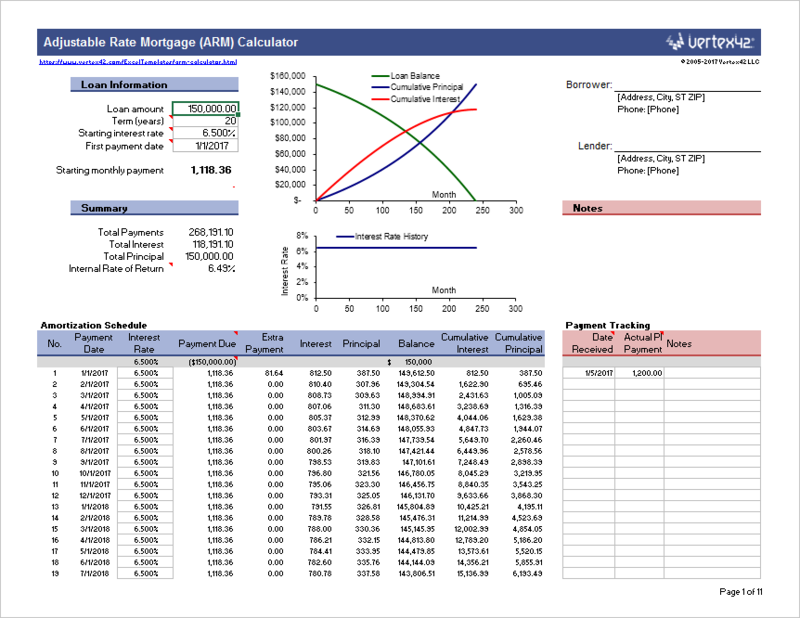 Download a free ARM calculator for Excel that estimates the monthly payments and amortization schedule for an adjustable rate mortgage. This spreadsheet is one of the only ARM calculators that allows you to also include additional payments. The monthly interest rate is calculated via a formula, but the rate can also be input manually if needed (i.e. overwriting the cell formula). 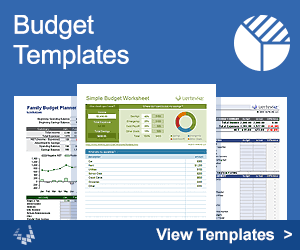 This spreadsheet creates an amortization table and graphs for an adjustable rate mortgage (ARM) loan, with optional extra payments. Estimate the maximum interest rate and monthly payment for common fully amortized ARMs. Update 5/25/2017: A new "Tabulated" worksheet has been added that allows you to use a table to list interest rate changes by date. Changes should be in chronological order. Interest is not calculated on a daily basis. If a date does not correspond to the Payment Due date in the amortization schedule, the interest rate change is not applied until the next payment. Update 9/20/2018: In the main worksheet, you can manually enter interest rates in the Rate column, overwriting the existing formula. Highlight the cells to mark the changes you make. Note: The newest version of the home mortgage calculator does almost everything this calculator can do. In this new version (added 5/25/2017), columns have been added for basic payment tracking. The date the payment is received or paid is just for reference (interest is not prorated based on the date paid). When you enter the Actual Payment, the extra payment column is calculated for you. The actual payment should only be the principal+interest portion (the spreadsheet does not track fees or escrow). You can also edit the interest rate to be used for calculating the interest each month. There are many types of ARMs, but this spreadsheet provides a way to calculate estimated payments for a Fully Amortizing ARM (the most common type of ARM). As an example, consider a "5/1 ARM". A 5/1 ARM means the interest rate remains fixed for 5 years (60 months). After that, the interest rate can adjust at a frequency of once per year. This means that your monthly payment can change! If a home is purchased during a period in which interest rates are extremely low, you might expect the rates to gradually increase. If a person knows they are going to sell a home after 7 years, then a 5/1 or 7/1 ARM might be desirable. If a person is going to own a home for more than 10 years, an ARM can be risky! Because they are risky, adjustable rate mortgage loans often have lower initial interest rates (which is why people seem to like them). Another reason an adjustable rate mortgage might be desirable is if the interest rates are extremely high and a person believes that the rates are gradually going to decrease over time. This would lead to gradually lower monthly payments.